SIR ALEX FERGUSON: "It's going to be a very successful few years for Chelsea." Speaking at the League Managers Association Dinner last night, on the same night as Chelsea held their annual Player of the Year awards, Sir Alex Ferguson has spoken of Jose Mourinho and believes that it's going to be a very successful few years for the club moving forward. Jose had won the Barclays Premier League Manager of the Year last week but chose to attend the Chelsea awards night so missed the LMA evening and wasn't there to collect his award. He did however send a video message to those in attendance. 'He's a successful man, a winner. He deserves the award. I thought he had the best squad. John Terry played every game. It's great to see how these two have developed a friendship over the years. It was obvious there was always respect and we often hear Jose speak of Ferguson as the "greatest ever!" so to hear Sir Alex speak of Jose the way he does these days is always nice to hear. I just hope Sir Alex is right and this is the beginning of another successful period for the club under Mourinho as it has all the signs that it could be. Chelsea just need two or three positions bolstered by new signings and we will be ready to go again next season. 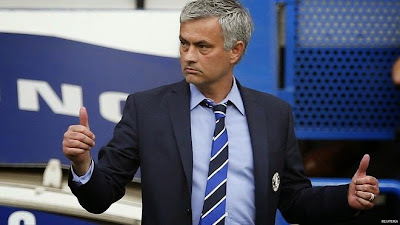 You cannot underestimate the achievements of everyone at the club this season and especially Jose Mourinho. There is no-one better!